We ship worldwide, but in our webshop you can order only to European countries, and USA, and some territories of Canada and Australia (Vic, NSW). If you want to order to other country please contact us. We need 1-3 business days to dispatch your order, and shipping takes 3-5 business days, so usually you will receive your order in 3-6 business days. For the crates you will receive a tracking number, but we don’t provide to elastic cord orders. We will email you the tracking number. When can I receive pre-order items? You can pay via PayPal (and credit card payment) or direct bank transfer. Sure, you can return the products within 30 days. Please read our Return policy about this. There is the video about how you can assemble the parts to a super light XOXO crate. How to mount the crate to the bicycle? You have to fix the crates to your own carrier (luggage) rack (not included). It can be a front or rear rack. We will send you instructions and one pair of metal mounting brackets. It is easy, you only need a hex key (Allen key) and pliers. What kind of carrier rack do I need on my bike to fix the crates? 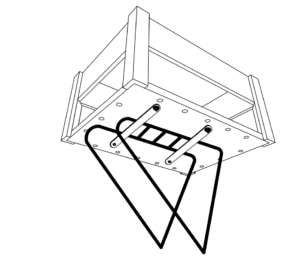 The crate can be fastened to most metal front and rear luggage rack using the supplied metal mounting brackets (one pair). It can’t be fastened to plastic racks. When will be SPOTTY crate available again? We are not sure. Although Spotty crate looks beautiful, it is too heavy to most bicycles, and manufacturing it is very difficult. If we see that there is a high demand for this crate we will restart manufacturing it. Would it be possible to order coloured crates from XOXO? You can choose the colours of the shock cords, and dark and light version of the crate. We plan to manufacture coloured crates as well in the future. Email us about this. Can I paint the crates by myself? The crates have got a natural oil treatment (against rain) so the surface is not good for painting. Is it possible to use the crates in every season? What about rain? Crates were created on purpose to use them outdoors. The material of the crate is durable wood (XOXO: plywood, ZIGZAG, SPOTTY: ash) with special oil covering, all the accessories are waterproof, stand up to the elements, even if it is rain or sun. But please do not store the crates outside during bad weather. During manufacturing the crates get a special oil coat, which helps to make them waterproof. We advise to rub the surface with linseed oil once a year to keep this waterproof layer.